The soft market may be limited in length and severity, though that would be surprising, according to the latest analysis of commercial insurance pricing from online insurance exchange MarketScout. The comments came as MarketScout reported that the composite rate for U.S. commercial property/casualty insurance declined by 2 percent in April, compared to a 3 percent decline in March and minus 4 percent in January and February 2016. Rates changed in most coverage classifications with property, business interruption, BOP, inland marine, workers’ compensation, general liability, and fiduciary all moderating by 1 percent as compared to March. Umbrella, auto, D&O, EPLI, crime, professional and surety were unchanged, according to MarketScout. By account size, rates for small accounts (under $25,000) were down 1 percent from March to April. All other account sizes were down 2 percent in April 2016, compared to minus 4 percent in March 2016. 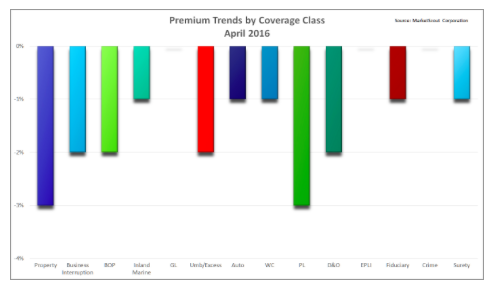 By coverage classification, transportation accounts adjusted more than any other industry classification from minus 4 percent in March 2016 to minus 2 percent in April 2016. Manufacturing, habitational, public entity and energy accounts all moderated 1 percent in April, while contracting and service accounts remained unchanged. Check out this post over at Artemis blog for more on why the moderation in commercial insurance rates is unlikely to persist. The Insurance Information Institute has further information with financial results and commentary on the p/c insurance industry here. A couple of new studies appear to shed light on the continuing need to communicate the importance of insurance for small business owners. First, a Nationwide-sponsored survey found that 66 percent of small businesses do not have business interruption insurance (hat tip to Insurance Journal for its report here). This is despite the fact that an estimated 25 percent of businesses do not reopen following a major disaster. Most small business owners are at risk of disaster, Nationwide noted. Some 75 percent of small businesses do not have a disaster recovery plan in place, even while 52 percent say it would take at least three months to recover from disaster. Nationwide commissioned the survey from Harris Interactive, which polled 500 U.S. small business owners with fewer than 300 employees from June 8-19, 2015. Meanwhile, a J.D. Power study found that many small business owners are unaware that insurers even provide commercial insurance. Less than one-fourth of small business owners said they were aware that nine of the 17 insurance providers included in the study offer insurance for business customers. Only six insurers had awareness rates above 40 percent for their commercial insurance offerings, and five of these are among the largest personal lines insurers, J.D. Power said. While advertising is important to spread brand awareness, the study suggested that commercial insurers have better success when they develop awareness through agents/brokers, trade groups and word of mouth from other businesses. The proportion of customers who considered/shopped an insurer among all potential prospects is 61 percent when awareness comes from an agent/broker or trade group, compared with just 38 percent when awareness is attributed solely to advertising. Still, the study–now in its third year–found that small business customers are increasingly satisfied with their insurance providers. Overall satisfaction was up 10 points at 793 on a 1,000-point scale in 2015, due primarily to improvements in price and policy offerings. The 2015 U.S. Small Business Commercial Insurance study is based on 3,292 responses from insurance decision-makers in businesses with 50 or fewer employees that purchase general liability and/or property insurance and was fielded from April through June 2015. The Insurance Information Institute’s excellent online resource for business insurance is available here. Another day, another commercial lines pricing survey. This one via Towers Watson. While this marked the 11th consecutive quarter of price increases, the gains appear to be tapering off, dropping a point since the CLIPS edition a year ago, Towers Watson said. The survey compares carriersÃ¢â‚¬â„¢ pricing on policies underwritten during the third quarter of 2013 to those underwritten in the same quarter of 2012. Price increases by line of business were lower than those reported in the second quarter in all lines, with the exception of employment practices liability. Employment practices liability experienced the largest price increase year over year, with price increases spiking into double digits, followed distantly by workers compensation and commercial auto. Prices for most lines of commercial insurance showed gains in the mid-single digits, while none of the classes surveyed reported a price drop, according to Towers Watson. Hettinger added that loss cost trends are benign Ã¢â‚¬“ in fact, carriers are reporting flat loss costs. Survey respondents reported that loss ratios have improved between 3 percent and 6 percent for accident-year 2013 relative to 2012 (excluding catastrophes), as earned price increases more than offset stagnant reported claim cost inflation. Check out I.I.I. facts and statistics on commercial lines. Online insurance exchange MarketScout just reported that the commercial insurance rate index for the United States rose 4 percent in February 2013. Commercial property insurance led the pack with a rate increase of 6 percent, followed by commercial auto and umbrella/excess with increases of 5 percent. General liability rates were considerably more competitive with rates up 4 percent, compared to up to 6 percent the previous month. Over the last year, transportation and energy have led rate increases most of the time. However, for February, transportation was up 4 percent and energy was up 3 percent. The only industry with a lesser rate increase was public entities. By account size, rates continue to be more competitive the larger the account, according to MarketScout. Small accounts (premiums up to $25,000) were up 6 percent and jumbo accounts (over $1 million) were up 2 percent.